We’re always told that technological progress is a good thing. It’s going to make us live longer! It’s going to make climate change go away! It’s going to give us lives of endless leisure and joy! Well, maybe not so much. Social media is increasing depression among teens, robots are taking our jobs — and do we really want Amazon drones polluting our airspace over our homes? While we’re being distracted by the latest technological wonder, we’re running out of time to deal with the crises that define our future. Our options are limited to the tools we have right now. And some of those tools are ones we’ve had since way before the digital age. 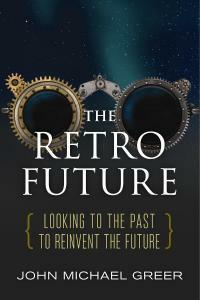 John Michael Greer’s new book The Retro Future is about one very powerful option: deliberate technological regression. That’s right: going back to the future. This isn’t about going back to the Stone Age, Greer says. It’s about using the past as a resource to meet the needs of the present. Older technologies generally use less resources and are cheaper than their modern equivalents. Greer says we have choices: use or refuse the technologies pushed by corporate interests. John Michael Greer is the author of numerous books, including The Ecotechnic Future and Green Wizardry, both books he’s talked about with us on Writer’s Voice. Listen to our past interviews with Greer. We all want to fight global warming, yet each day, we contribute more to it. It’s inevitable. We need to use cars to get around. We need to heat our homes. Many of us eat meat. We don’t yet have the infrastructure to make it easy to cut our emissions. It doesn’t seem to be all that easy to be green. And what good would it do? It’s a drop in the bucket, right? But Peter Kalmus says it’s easier, more fun and more effective than you think to change your life and the world to tackle climate change. He began by bicycling, growing food, meditating, and making other simple changes. Turns out, he slashed his climate impact to under a tenth of the US average and became happier in the process. 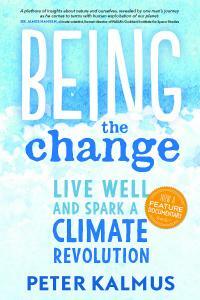 His book, Being the Change explores the connections between our individual daily actions and our collective predicament. Peter Kalmus is a climate scientist at NASA’s Jet Propulsion Laboratory. He lives with his wife and two children in suburban California. His views and opinions are his own and do not represent NASA’s Jet Propulsion Laboratory.